The Fourth Edition of Niva Tro’s Chemistry: A Molecular Approach reinforces development of 21st century skills including data interpretation and analysis, problem solving and quantitative reasoning, applying conceptual understanding to new situations and peer-to-peer collaboration. 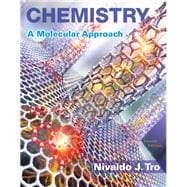 Nivaldo Tro presents chemistry visually through multi-level images–macroscopic, molecular, and symbolic representations–helping readers see the connections between the world they see around them (macroscopic), the atoms and molecules that compose the world (molecular), and the formulas they write down on paper (symbolic). The benefits of Dr. Tro’s problem-solving approach are reinforced through digital, Interactive Worked Examples that provide an office-hour type of environment and expanded coverage on the latest developments in chemistry. New Key Concept Videos explain difficult concepts while new end-of-chapter problems including Group Work questions and Data Interpretation and Analysis questions engage readers in applying their understanding of chemistry. The revision has been constructed to easily incorporate material to engage readers. MasteringChemistry from Pearson is the leading online homework, tutorial, and assessment system, designed to improve results by engaging you before, during, and after class with powerful content. Instructors ensure you arrive ready to learn by assigning educationally effective content before class, and encourage critical thinking and retention with in-class resources such as Learning Catalytics™. You can further master concepts after class through traditional and adaptive homework assignments that provide hints and answer-specific feedback. The Mastering gradebook records scores for all automatically graded assignments in one place, while diagnostic tools give instructors access to rich data to assess your understanding and misconceptions. Mastering brings learning full circle by continuously adapting to your learning and making learning more personal than ever–before, during, and after class. Note: You are purchasing a standalone product; MasteringChemistry does not come packaged with this content. Students, if interested in purchasing this title with MasteringChemistry, ask your instructor for the correct package ISBN and Course ID. Instructors, contact your Pearson representative for more information. 0134103971 / 9780134103976 Chemistry: A Molecular Approach Plus MasteringChemistry with eText -- Access Card Package. Nivaldo Tro received his Ph.D. in Chemistry from Stanford University. He completed his postdoctoral research at the University of California at Berkeley. In 1990, Dr. Tro became a faculty member at Westmont College in Santa Barbara, California. During his time at Westmont, he has been awarded grants from the American Chemical Society, Research Corporation, and the National Science Foundation. Dr. Tro has received Westmont’s outstanding teacher of the year award three times. He is the successful author of the market leader text, Introductory Chemistry, 5e (Pearson), Chemistry: A Molecular Approach, 3e (Pearson), Chemistry: Structure and Properties, 1e (Pearson),and Chemistry In Focus: A Molecular View of Our World, 4e.